How do I keep my lawn looking green and lush? The spring is sprung, the grass is riz – I wonder where the mower is! When I give my lawncare talk to gardening clubs, I start by asking the audience what’s the most important operation to get a fabulous looking lawn. After shouting out feeding, spiking, aerating, scarifying and a range of other answers, someone finally gives the right one – mowing. That’s right, get your mowing wrong and you can more-or-less forget about doing anything else to your lawn. Grass will be growing strongly this month, so the lawn will need regular mowing from now onwards. Most people mow their lawns far too short, scalping the grass, or they mow too infrequently, both of which weaken it and allow weeds and moss to establish. 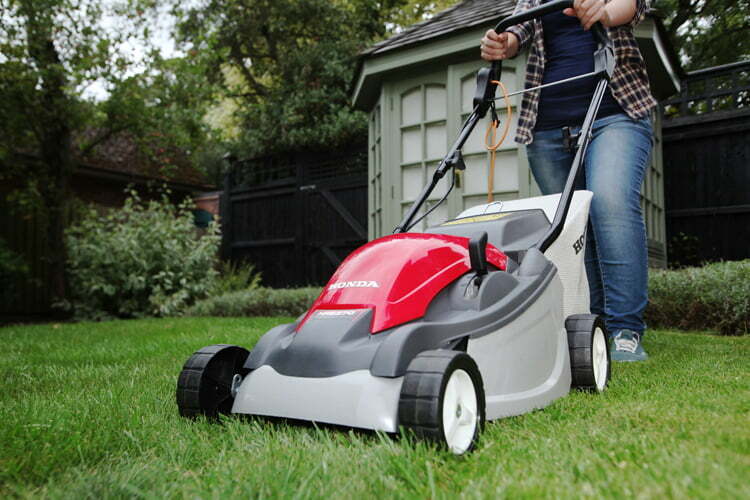 For the best quality lawns, it should be cut whenever it reaches a height that can be cut. Ideally, you should simply “tip” the grass at each mow, taking off the very tip of the grass blades and do not remove more than one-third of its height at any cut. And keep the grass at more-or-less the same height all year round. For normal lawns that take a lot of wear and tear, the height should be around 4-5cm (1½-2in). For “bowling green” lawns of fine-leaved grasses this should be about 2-2.5cm (¾-1in). For lawns growing in shaded areas, mow even higher – around 7.5cm (3in). These heights can be raised slightly in autumn and winter and during periods of prolonged drought in summer. 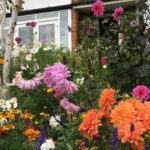 One question we’re often asked in the Flower Power Gardening Club [LINK TO: https://getgardening.richardjacksonsgarden.co.uk/gardeningclub] is when do I stop mowing in autumn and start again in spring. The simple answer is – you don’t! You should mow whenever the grass is growing. Grass grows at temperatures of 5C (41F) and above, and in mild winters it will still grow. The only thing to prevent you getting out the mower is if the grass/soil is too wet and/or frozen, or in summer, during prolonged drought, it won’t grow as much, so won’t need cutting so frequently. If you haven’t been mowing through the winter, you’ll need to set the blades at their highest height and then gradually reduce this with subsequent mowings. You could stress and weaken the grass if you make the first cut too low. Don’t forget that grass IS a plant and needs as much care as any other plant growing in the garden. So, after mowing, watering and feeding to keep it growing strong and healthy are the next most important lawncare operations. Unbelievably, every square metre of lawn looses around 24.5-litres (4½ gallons/square yard) of water per week in summer. And if you want to keep it looking great, you’ll need to replace this, watering once a week. Of course, lawns nearly always bounce back and recover in autumn after a drought even if they haven’t been watered, but the lack of grass growth encourages lawn weeds and moss growth. People who don’t like mowing, don’t want to feed their lawn either. “Well, if you feed it, it grows more, so you have to mow it more”! It’s true that feeding does make it grow more quickly, but it also does other vital things that will help ensure your lawn makes everyone who sees it green with envy. Regular mowing removes a lot of nutrients, and for a lawn that looks fabulous, lush and green you need to replace these nutrients with a lawn feed. Good feeding also makes the grass thicker, stronger and healthier, so it is better equipped to fight off moss, weeds and even drought stress in summer and cold and wet stress in winter. Liquid lawn feeds are a great choice as they start to work straight away, are far less likely to burn the grass than granular feeds and are less dependent on correct weather conditions. If you want to get great results, follow the lead of greenkeepers and groundspeople and use a “professional” feed. By which, I mean use Lawn Magic! 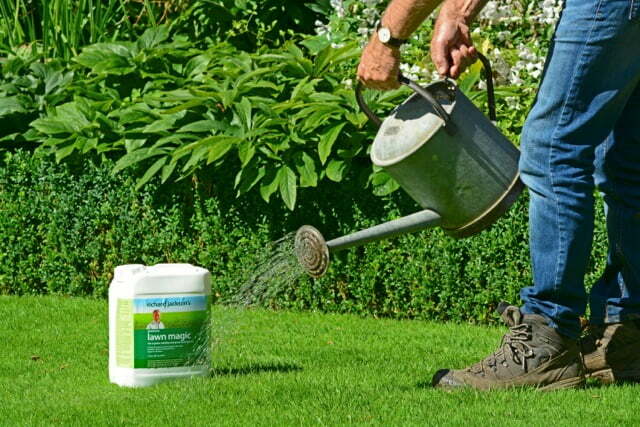 As it contains iron sulphate, it will also help to keep moss in check. And talking of moss, have you seen Richard’s revolutionary new Premium Moss Remover. When it comes to moss, just be aware you should never rake out live moss, as this spreads it further and makes the problem even worse! After this winter and last year’s Mediterranean summer, many lawns are struggling with bare patches, patchy, uneven growth and very thin areas of grass. All three can be cured with a simple application of fresh grass seed. You can reseed bare areas and overcome thin and patchy growth by something called overseeding. Simply scatter grass seed over the whole lawn at the rate of 15-25g per sq m (½-¾oz per sq yard), work it into the soil with the back of a rake or similar and water it in. Apart from regular care, this is the secret weapon used by greenkeepers and groundspeople to produce quality greens and pitches. Richard’s Premium Triple Use Grass Seed is perfect for starting a new lawn from scratch, reseeding bare patches and overseeding tired lawns. If all this sounds like hard work, then how about letting the grass grow and convert your lawn into a wildflower meadow? Not only does it involve less, regular work (it isn’t work free), you’ll be able to enjoy all those delightful wildflowers – and the local wildlife will love you forever.